The Skeptical Adaptationist: Why are humans such lousy dog trainers? Why are humans such lousy dog trainers? Training Lucy has taught me so much. Mostly it has taught me what a lousy dog trainer I am. I started off confident that my knowledge of psychology and learning theory would make me a superior dog trainer. Besides, humans have been training dogs for thousands of years, and, we have had a few hundred thousand years to learn how to influence each other. So, it shouldn't be hard to train an eager, smart, poodle puppy. Not so! Over and over again, I discover that my innate dog training inclinations are exactly wrong. I say, Lucy, Come! She runs away. Annoyed, I call her name in a harsh commanding tone: LUCY! She looks toward me, then runs further away. I come in the door at home. Lucy jumps up on me eagerly. I say firmly, NO! Down!, all the while looking at her and touching her to try to get her to sit down. Every time I come home, she jumps a bit more wildly. STAY! I say, giving the hand signal as well. Lucy sits, and looks at me. Wonderful! I give a reward. Immediately, she jumps up and runs ahead. No, Lucy, stay staying, please! We are at the dog park, and it is time to go home. COME! Lucy, I yell. She immediately runs to the far corner of the dog park. I chase her. She runs faster. Much faster than I can. Thanks to help from several experienced dog trainers, I have gradually overcome the worst of my natural dog as training habits, but only very gradually and with constant inhibition of my natural impulses. Gradually, I learn that her name must only be used in a positive setting. I discipline myself to completely ignore her jumping behavior. I gradually figured out for myself, that to get her to stay, I need to give her not just one, but a series of treats at random times during the stay. And, at the dog park, I began calling her every few minutes, leash in one hand, treat in the other, until COME! at the dog park no longer signals that she will soon be separated from her happy pack. If natural selection is so great, why aren't we better dog trainers? It seems that we humans are lousy at using rewards and punishments to influence the behavior of all others, not just dogs, but people as well. In my work as a psychiatrist, I am constantly amazed at spouses who angrily demand love from a partner. Then there are parents who fear a daughter will be promiscuous, so they make wild angry accusations whenever she stays out too late; they are not surprised when she fulfills their expectations. Neither am I, but for different reasons. Then, there are parents who yell at their infants, telling them to stop crying; when the baby does not obey, they get enraged. How can we are so poor at the most basic skill of influencing others? Another possibility to explain our specific deficit in dog training abilities is that we use strategies that tend to work to influence adult humans. Anger and commands can influence others, especially if they’re dependent or lower in social rank. In the long run it creates enemies looking for opportunities for revenge, but in the short run it works. Words work to influence humans. For dogs, hand signals are far better, words are far less influential and the tone is as important as the phonemes. Why don’t we all have better innate dog (and person) training skills? This is worth more thought. Hello, I am as lousy as you are as a dog trainer and I have no suggestions on the matter, but please let me tell you how much I loved your book "Why we get sick". It's one of my favorite books ever (and a source of inspiration for my evolutionary psychology work). THANK YOU. My friend had a dog that she inadvertently trained to stay out by the back fence until she offered it a treat. For one thing, we're primates and they're carnivores, so our signalling systems are different. They do NOT like to have an arm draped over them in friendly fashion: to them, it's a put-down (dominance gesture). They like to be chucked under the chin, basically. You were a lucky one. 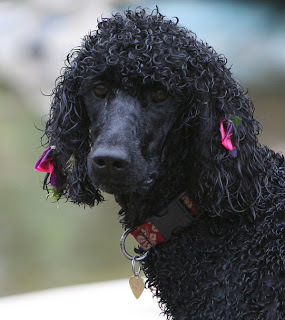 My poodle has re-educated me and I am now in full compliance.